Uthappa is delighted for his KKR skipper. The BCCI announced India’s 15-man World Cup squad earlier today as took a couple of tough calls. Ambati Rayudu who was being looked at as the number four batsman all this while was dropped from the team. 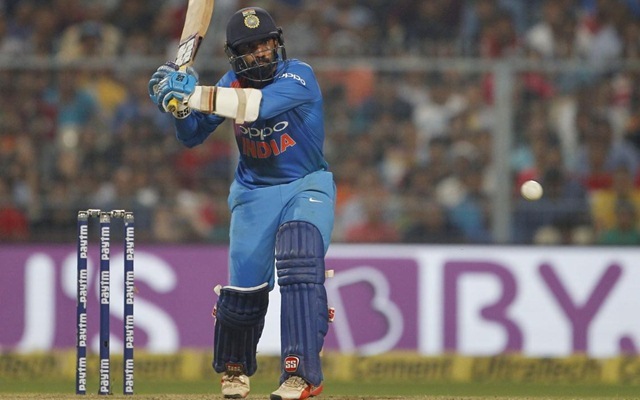 Even Rishabh Pant wasn’t picked and the experienced Dinesh Karthik got the nod as the backup wicket-keeper for MS Dhoni. MSK Prasad, the chief selector, cleared that Karthik was picked for his experience and the Tamil Nadu player deserved every bit of it. Karthik is currently busy playing in the ongoing Indian Premier League (IPL) where he is leading the Kolkata Knight Riders (KKR) and his teammate Robin Uthappa is chuffed after his selection. He termed Karthik as India’s best finisher in the last couple of years which is, in a way, true. Karthik’s career turned dramatically in Nidahas Trophy when he finished the game for India in the final against Bangladesh. Since then, he has been consistently the part of the Indian team. Dinesh Karthik will be looking to make an impact in the World Cup as well. He has been part of the World Cup squad before and has the experience of handling that kind of pressure in the big tournament. 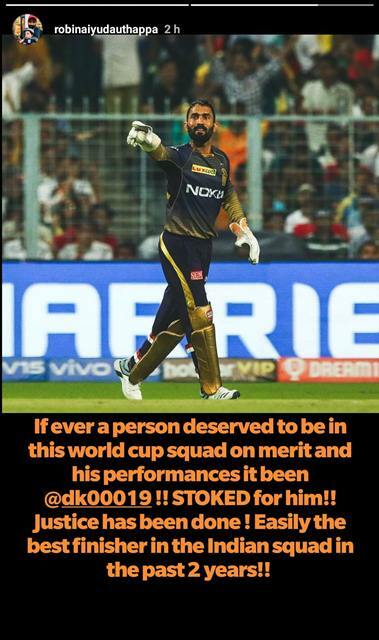 Robin Uthappa was so happy for Dinesh Karthik after he got selected in the World Cup squad and went on to dedicate a story on Instagram for him congratulating his KKR teammate. While many are terming his inclusion as a surprise, Uthappa felt that Karthik deserved every bit of it. “If ever a person deserved to be in this World Cup squad on merit and his performances, it has been @dk00019!! STOKED for him !! Justice has been done! Easily the best finisher in the Indian squad in the past 2 years,” Uthappa wrote while expressing his delight for Karthik.